Here you'll get the best solution to backup iPad to Mac without limitations at an alarming speed. To make a backup of iPad/iPhone successfully like voice memos, you may think your free iTunes and iCloud can serve things well enough. However, iCloud only offers 5G storage space free for contents storage excluding songs while claiming monthly charges for each upgrade storage plan you choose, and iTunes won't allow copyright infringement-prone iPad to Mac music duplication to happen. 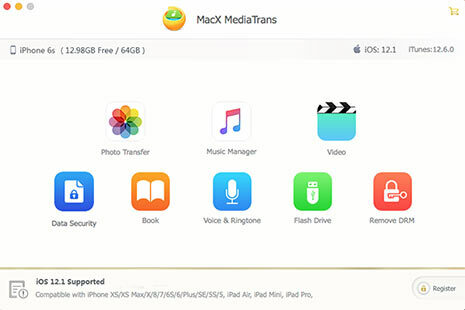 So here, we recommend you MacX MediaTrans, which costs merely $35.95 once for all to have lifelong backups of your entire handset memories including video, music and photos unlimited from iPhone/iPad to your Mac within a few clicks and auto converts video format into MP4 h264. Get MacX MediaTrans now on your iMac, MacBook Pro/Air, Mac Mini or Mac Pro to experience its ultra-fast smooth performance on iPad to Mac backup! To backup an iPad to Mac, the endless wait is one of the biggest pet peeves in the whole process. And more annoyingly, it takes like 10 years for thumbnails to display on Mac when you tend to browse the photos – iTools takes about over 400 sec to get 1000 thumbnails to show up for instance. This is where MacX MediaTrans excels at: With Intel QSV CPU acceleration, MacX MediaTrans takes an axe to iPad-Mac backing-up speed by 3 quarters, meaning now you can transferr 1G video/movie from iPad Pro/Air/Mini 4 and more to Mac within 17 sec, backup 1000 photos from iPad to Mac within 100 sec, or batch copy 32G files/voice mail/memo/messages from iPad to Mac within 9 minutes. The same works on backing up iPod/iPhone to Mac. If the limited Mac storage is what you are concerned about, purchasing an affordable hard drive to extend space won't be a bad idea. By the way, the premise of all this is that you have a computer with good configuration. * iPad backup extractor to bring along backups wherever you go. * Speaking of best value, this solution turns your iPad available storage space into a USB flash drive for free in its full version and trial version alike! You can save pdf, docx, jpg/png, mp4, wmv, exe, dmg files backed up in Mac to iPad/iPhone in case you forget your flash drive. 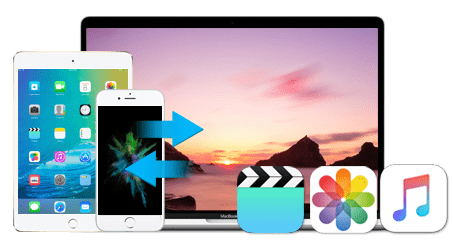 * In addition, iTunes purchased M4V videos/movies not only can be transferred from iPad iPhone to Mac, but also can be decrypted to MP4 videos without DRMs. * Also, for bonus feature: portrait mode to landscape mode video rotate is condoned by this iPad backup software, which means that one can have a vertical video automatically rotated sidewise to fill iPad/iPhone screen and enter full-screen view. How to Backup Videos Photos Songs etc. from iPad to Mac? First, download MacX MediaTrans and launch it on your Mac (macOS Sierra also incl.). You are free to download MacX MediaTrans trial version and give it a go before purchasing its full version. This guide is also applicable to backup iPhone to Mac. Run this professional iPad backup software - MacX MediaTrans on Mac and then connect your iPad with Mac via data cable. Open iTunes after launching MediaTrans. Note: You'd better follow the pop-up on-screen guide to avoid iDevices being synced automatically by Mac or data loss in your iPad. Your iTunes shall be upgraded to 11.2 version and above to respond accordingly. Click Video button (or Photo Transfer, Music Manager) on MediaTrans UI to browse the videos, images, songs saved in your iPhone/iPad. Check "Select All" or select target file one by one to get ready for iPad-to-Mac backup. Note: You can uncheck the item by clicking the preceding checkmark again or clicking the blank area of MediaTrans UI. This iOS backup software will let you customize your backup files in Settings. There, you can browse and choose the ideal default export path like directly to another hard drive. If you have some slutty music vids for backup transfer, you can clear music video transferring cache later on to avoid being spotted. Fast backup software for iPad, iPod, iPad. It can make a backup of data from iPhone iPad iPod to Mac, including photos, videos and music and vice versa, without iTunes. Guide to transfer photos from iphone SE/6S/6 etc.